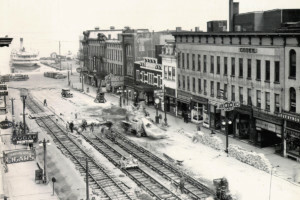 The Cooke Block (the large building on the right) around 1920 as tracks were being stalled along Columbus Ave. You can see steamboats at the dock in the upper left. The Cooke Block (the name “Cooke” still adorns the third floor fascia) has been in existence since the 1850s. The north section, the Union Bank Building, was built first followed by the main section. The building was erected by Wildman Mills, who sold it to two brothers, Charles E. and George A. Cooke (no relation to Jay Cooke). 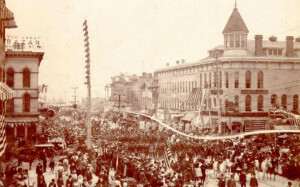 The building featured a beautiful and striking cupola for many years, as seen in the photograph of the parade of Spanish-American war veterans on Columbus Avenue in 1899. The cupola was lost in the tornado of 1924. 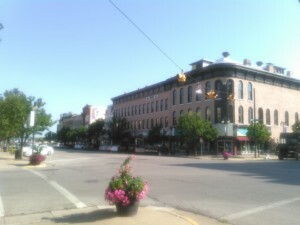 Over the decades the building has housed a number of different businesses, professional offices, and government agencies. Sanduskians and Erie County residents of a certain age will remember when the first floor corner was occupied (1960s-1980s) by the Holzaepfel Brothers sporting goods store. August 8, 1861 – Cheap Dry Goods. All kinds of dry goods will be sold at reduced prices for the next month, by Cooke & Converse, and many articles such as French Cloth Mantillas and Summer Shawls, at New York prices. Dress goods, a full assortment of parasols and large stock of the best make of Hoop Skirts. Now is the time to get bargains! Cooke & Converse. December 14, 1866 – Kris Kringle – That jolly old Elf has just been around with his ‘prancing team and jingling bells, his little round belly shaking like jelly.’ And established a depot of choice and beautiful Christmas Gifts for his holiday friends at Cooke’s Cheap Cash Christmas China Store. 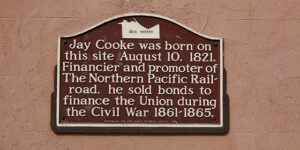 A marker on the north side of the Cooke Building which faces East Market Street marks the location where Jay Cooke, Civil War financier and developer of the Northern Pacific Railroad was born on August 10, 1821. 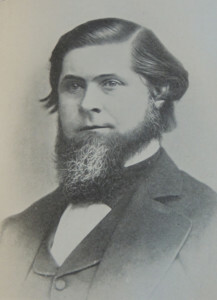 Cooke’s parents, Eleutheros and Martha Cooke, were in the process of building a home half a block away on Columbus Avenue and Jay Cooke was born in the house of a friend, Dr. George Anderson. The Cooke house was at the corner of West Washington Row and Columbus Ave.
Cooke left Sandusky when he was 18, eventually settling in Philadelphia where he became a successful banker. He founded his own firm in 1861 at the age of 40. Arguably the Sandusky native who has had the most impact on our national story, Cooke created a very successful program for selling bonds to help finance the Union war effort during the Civil War. A sales and marketing genius, Cooke introduced sales techniques and strategies that were later adopted for the great war bond drives of the 20th century. He sold bonds utilizing an emotional appeal to a buyer’s patriotism. He also sold bonds in denominations as low as $50, even allowing purchase on the installment plan. These strategies had never before been used to sell financial products. Cooke’s firm managed over $1.6 billion in bond sales during the Civil War. Deeply religious, strongly anti-slavery, and a patriot, Jay Cooke was committed to the Union cause but also an astute businessman. In the immediate post-Civil War period, he was probably one of the richest men in America. In addition to a mansion in Philadelphia, Cooke bought Gibraltar Island in Lake Erie and built a magnificent summer home on the island called Cooke’s Castle. Cooke and his extended family spent 40 summers on Gibraltar, which is now owned by Ohio State University. 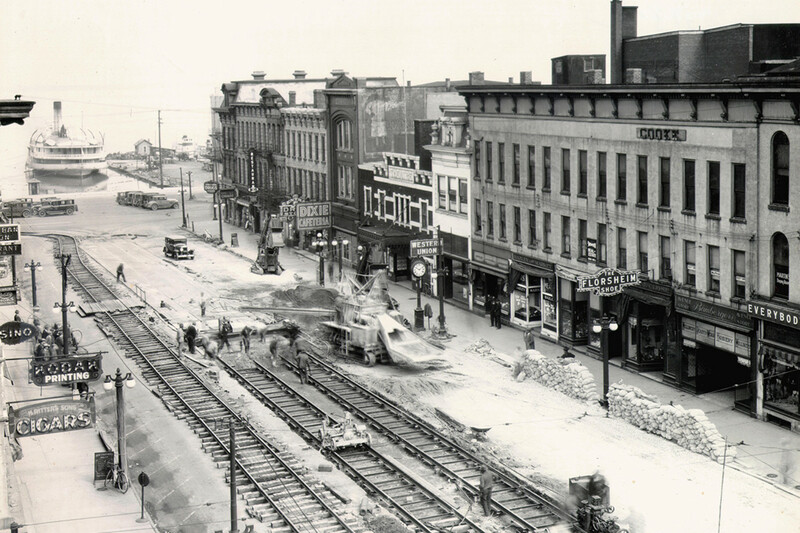 Always a believer in the country’s western destiny, in 1870 Cooke’s bank took the lead in financing the Northern Pacific Railway, a railroad line that would run from Duluth, Minnesota to Tacoma, Washington, connecting the Great Lakes to Puget Sound and the Pacific Ocean. There were numerous problems, including conflicts with Sioux Indians, construction and management issues, and low demand for rail services in what was still near wilderness. Cooke’s problems helped precipitate the Panic of 1873, the biggest economic downturn of the 19th century. Cooke was overextended and lost his railroad and his fortune. However, Cooke did recover much of his resources through investments in a silver mine, but by the mid-1880s he had largely retired from business. His railroad line, which became the Northern Pacific Railroad, was completed by others and formally opened in 1883. Cooke died in Philadelphia in 1905 at the age of 84.